Paris has the Eiffel Tower, Barcelona has the Sagrada Familia, and Seville has as its main landmark one of the most famous Arabic monuments in the world: La Giralda. This tower is the main tourist attraction of this beautiful southern Spanish city, the heart of Andalucía. La Giralda is the bell tower of the Seville Cathedral, but used to be a minaret, as it was built when Seville was part of Al-Andalusm, that is, Muslim Spain. The tower was built between 1184 and 1198, modelled after the tower of the Koutoubia mosque of Marrakesh. The Hassan Tower of Rabat was also modelled after this mosque. It was intended to be the largest minaret in the world but was never completely finished. After Seville was taken back by the Christians, La Giralda was repurposed as a Christian church. 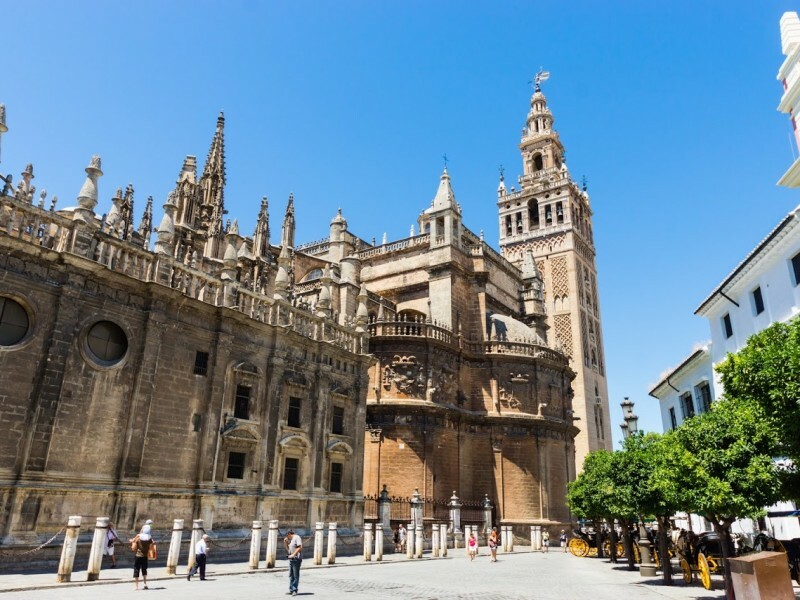 Seville’s Cathedral would be built later so La Giralda could be its bell tower. Seville’s main landmark is 101 metres high, which makes it higher than London’s Big Ben and the Tower of Pisa. In 1987, the UNESCO declared as a World Heritage Site, an understandable step due to its rich history and its great artistic and architectural value. Keep in mind that, due to the important historical changes that the monument experience, its structure suffered many changes too: Its two inferior thirds used to be part of a mosque, which means they are of Arabic style, and has a top third that was added in Christian times of Renaissance style. Definitely one of a kind! La Giralda is a belltower, and, as such, is well provided with bells. It has 24 exactly, and each of them has its own name. On top of La Giralda you will see a statue known as Giraldillo (which could be translated as “the little giraldo”), which was added to the top in the 16th century to represent the triumph of the Christian religion over the Muslim. Besides its two “sisters”, mentioned before, there are several Giraldas around the world. Kansas City has one, as well as other Spanish cities such as Arbós and Badajoz. Now you know enough to impress your travel companions once you visit Seville’s La Giralda. Don’t forget to tell us about your experiences in the comments! At GowithOh, we are an enthusiastic team of self-confessed Europhiles who are passionate about travel. We especially love the variety of city breaks possible in Europe, from the historic UNESCO heritage cities like Prague, to the more cosmopolitan beachside destinations like Barcelona. We love discovering the hidden gems in different cities and sharing them with our fans so everyone can benefit and enjoy the perfect city break in Europe.